Jimmy Gray was an Arsenal reserve right full back just after World War 2, and a batting all-rounder for Hampshire County Cricket Club between 1948-1966. Born in Southampton on 19 May 1926 and while at school he was evacuated to Poole during the early part of the war where he took up football. Spotted by Tom Parker, ex-Arsenal captain and first man to hold a major trophy aloft for the Gunners, he was duly recommended to Arsenal and signed as an Amateur on 10 August 1946. In the 1946-47 season he also appeared for the Salisbury Corinthians. Jimmy came onto the staff at Arsenal around the same time as another cricketer and good friend – Arthur Milton. The Comptons were already at Arsenal and the Hampshire wicket-keeper Ralph Prouton arrived shortly after Jimmy. In addition Jimmy played with Don Roper at the Deanery, a Hampshire cricket club. For more details of the preponderance of dual code players at Arsenal please see our previous article entitled Arsenal cricketers. 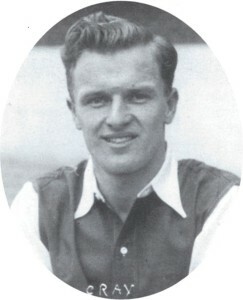 Having made his first appearance for Arsenal in a friendly against Walthamstow Avenue in May 1947, Gray was signed professionally at Arsenal on 25 August 1947 and given leave to continue his studies at Southampton University. Overall he appeared in 7 reserve team games and 50 ‘A’ team games. On 3 December 1949 in an Eastern Counties League game against Harwich he broke his collar bone, which kept him out of the team for almost three months. He spent five years at Highbury without a first-team appearance as Laurie Scott and Walley Barnes kept him on the fringes. In May 1951 he was informed he was not going to be retained by Arsenal and was given a free transfer on 31 July 1951, but he decided to call it a day as far as football at this level was concerned. He did continue playing football, though, but dropped down to the Southern League with Bedford Town FC, then managed by ex-Arsenal hot shot Ronnie Rooke. He remained there for a number of seasons and in the summer of 1954 signed for Salisbury FC. By concentrating on cricket, and freeing himself up for Hampshire, for whom he had debuted in 1948, he transformed his reputation in the summer sport and by 1952 was seen as one of the most improved cricketers in the country. He added to his reputation by coaching young cricketers at the Portsmouth naval barracks from the mid-1950s. Jimmy Gray was one of the finest of all Hampshire’s native cricketers, playing 458 first class games for the county scoring over 22,000 runs and taking 457 first class wickets. Gray was an opener, often with West Indian Roy Marshall, and they led the way to winning the County Championship in 1961. By the time Gray had retired he had hit 30 centuries for Hampshire. After his cricket career ended he taught at Stroud School, Romsey, eventually rising to Deputy Headteacher. Once he retired from teaching, Gray and Peter Sainsbury took over Holt & Haskell, a sports concern. He returned to Hampshire Cricket club in the 1990s serving on the committee and as chairman of the Cricket Committee. Jimmy Gray passed away on 30 October 2016, aged 90. We are indebted to Ian Nannestead of Soccer History who informed us of Jimmy’s passing.